More and more people are using Esbit as a primary or backup fuel. To expand your options for this, I have a UL Hanging Esbit Burner for FireFy and Emberlit stoves, and now the ULtimate Esbit System shown here. In designing components for this new system, I wanted to end up with the lightest possible Esbit kit that would work with essentially any pot and windscreen as well as the FireFly, had the flexibility to simmer and dry bake in your pot, as well as just heat water very efficiently. I also wanted components to be compact and easily stowed flat in a pouch or pot. All the ULtimate Esbit System components work well together, but can also be used as part of a system that includes a windscreen or baking pot insert you already have. You can get one of two Combo Pack options or individual components if you prefer. If you want a great windscreen, I make titanium windscreens to fit just about any pot, and these pair nicely with an ULtimate Combo Pack. The first video shows how things work together; the second video is a muffin baking demo. If you already have a FireFly (or are planning to get one), you can get the ULtimate Combo Pack with a Mini WindShield. 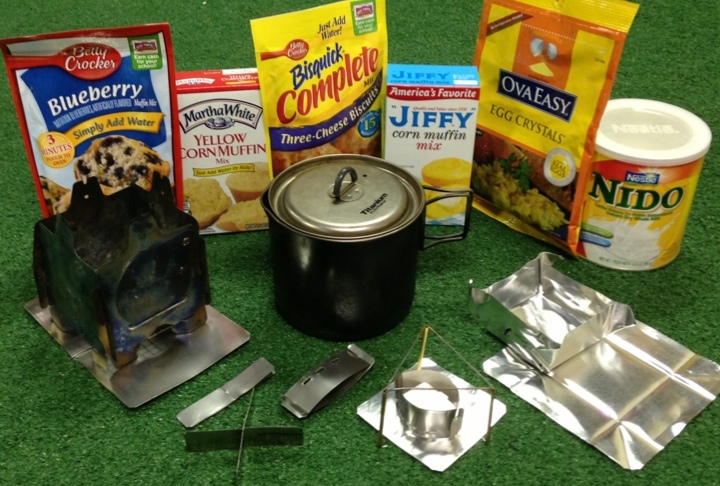 This adds all of the capabilities of Esbit backup, simmering, and in-pot dry baking for only one more ounce carried, and fits beautifully in your 8 mil ziplock or tyvek stove pouch. The titanium FireRing is placed on the aluminum Base. It controls air supply through its air intake ports to the burning Esbit cube. With ports down, a full cube burns in 15 minutes. With ports up, it takes 30-35 minutes, perfect for dry baking or simmering. Even though it forms a ring, it folds completely flat. The folding TriPod is a 2-inch high pot stand made of thin stainless steel rods and brass tubes. It will support even a full 1.3L Evernew pot. The TriPod has a new improved design not shown in the video. Go HERE to check it out. My BakePan is made from a special aluminum and is pinched at the corners to create a baking pan. Just flatten it out again to go into your stove pouch. It goes on top of the titanium XSpacer. I took an inch off each side of a regular titanium WindShield to create the Mini WindShield. WHAT'S IN A COMBO PACK? : The ULtimate Combo Pack has a FireRing, Base, TriPod, BakePan, and XSpacer. You can get it with or without a WindShield. You know you WANT one. NOTE: If a FireFly stove is ordered at the same time, I will give you a $3 shipping charge rebate for any of these items you add; if you order more than one I will rebate charges that exceed $3. Shipping outside the USA will add additional costs. Go to my Global Shipping Page to see what this cost will be and to add it to your order.